Notes: Rare cover with additional 'RSPB Action for Birds' meter mark. 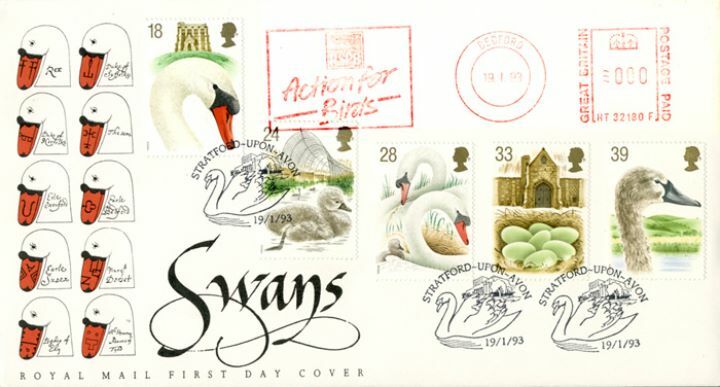 The above Royal Mail Swans stamps were issued on 19 January 1993 by Royal Mail and feature the following stamp designs: 18p Mute Swan; 24p Cygnets; 28p Mute Swans Pair; 33p Eggs; 39p Young Swan. The Action for Birds first day cover with the Stratford upon Avon, Swan, Special Handstamp postmark has been produced by Royal Mail/Post Office and features these stamps which can make a very collectible and lovely gift.